Announcement Welcome to Lucky Bear Soap Co. -Handmade in Oregon with the purest organic ingredients. www.LuckyBearSoap.com Watch our video to learn the rescue story of Lucky Bear. Congratulations! Lucky Bear Soap Co. Beard Oil rated Top 10 in the world! Stop in & check out our brick & mortar location: 1907 2nd St, Tillamook, Oregon! 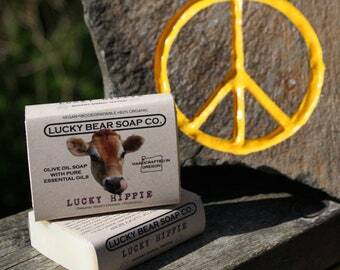 Welcome to Lucky Bear Soap Co. -Handmade in Oregon with the purest organic ingredients. LEMON VERBENA SPRAY Aromatherapy Pure Essential Oil 4oz. Aromatherapy Spray GOOD DOG SPRITZ with organic Pure Essential Oils 4oz. LUCKY HIPPIE Spritz Aromatherapy Spray Essential Oils Patchouli, Lemon, Lavender 4oz. Goes on so smooth and smells great!!! The smell is amazingly wonderful! It creates an instant feeling of peace, happiness & comfort. This will definitely be my new signature scent! Sky making handmade organic bar soap. Skyler Veek is the owner and creator of Lucky Bear Soap Co. in Tillamook, Oregon. Since childhood she has had a keen sense of smell and has always loved outdoor aromas. Some of her favorites include sweet freshly mowed clover during summer, eucalyptus leaves and pods that fall onto ground in the yard, the calming release of a handful of purple lavender in the garden and cedarwood. Skyler has never liked the artificial perfumes and phony fragrance oils sold in stores. She discovered Pure Essential Oils and fell in love. She spent years researching the healing powers of herbs & plants and their pure oils. Aromatherapy gives her the joy of experimenting with science and her passion for art, photography and design comes through in her product labels and packaging. She has learned to take the Pure Essential Oils and blend them into lotions, massage oils and aromatherapy sprays for the body, home, car and pets. In 2012, Skyler has launched a new line of natural, handcrafted vegan soaps called Lucky Bear Soap Co. Her great-grandmother handmade soap in a heavy cast iron pot over an open fire on her pig farm in Texas using pig tallow. Being a vegetarian, Skyler chooses to use all natural, vegan and organic ingredients in her soaps that she handcrafts in small batches. Skyler prides herself in using the highest quality food grade ingredients that she can find. Her product line currently has about 35 different pure oils from around the world. You'll never find any synthetic preservatives, petroleum, parabens, silicones, fragrance oils or plastics in Lucky Bear Soap Co. products. We are against Animal testing! Sage is an amazing student, athlete and apprentice in the soap shop. She makes products, keeps track of inventory, restocks product, greets customers and operates the register. Welcome & Thanks for shopping @ Lucky Bear Soap Co. I'm excited to offer these high quality products handcrafted with lots of love by me. All ingredients are food grade, natural & organic. All products include pure essential oils with numerous healing qualities. I do my best to describe each item as accurately & honestly as possible. Please contact me if you are not happy with an item. I carefully wrap all items using recycled materials. I ship out daily M-F. I can ship 6-12 bars of soap for $8 via Priority Mail. Skyler Veek is the owner and creator of Lucky Bear Soap Co. in Oregon.